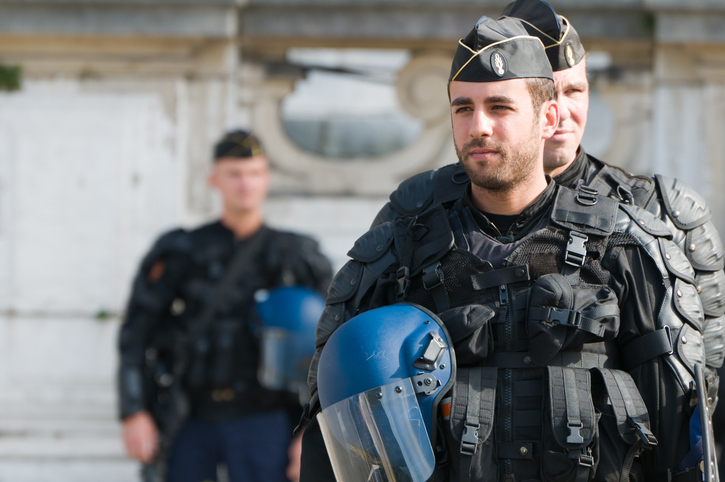 "Grenoble, France - September, 4 2010: Riot Police Officer"
On February 23, 2018, French Prime Minister Édouard Philippe announced a new plan to fight jihadist terrorism linked to conflict in Syria and Iraq. The plan is the latest set of measures in a succession of decisions, announcements and new laws in recent years. In April 2014, the serving Minister of the Interior, Bernard Cazeneuve, introduced the PLAT (Anti-Terrorism Plan) of 24 measures to prevent young French people from departing to Syria. At the time, 250 French nationals were reportedly already there. Considering the youth of these individuals, a mandatory “authorization to exit the territory”’ was reinstated for minors after being suspended in January 2013. Prevention campaigns were announced in cooperation with the Ministry of National Education and municipalities. A toll-free number for reporting radicalization suspects was set up (called CNAPR, National Center for Assistance and Prevention of Radicalization) and an online platform to report illegal internet content was announced (the Pharos online service, created by a decree in June 2009, is tasked with this topic, even though it remains competent for all kinds of reports). The network of prefectures was mobilized. People at risk were added to the national wanted persons file (FPR) and the Schengen information system (SIS), which is shared with the authorities of the 26 countries of the Schengen zone. These measures were also designed to hinder departures by air travel. Support for families by social workers and psychologists was part of the plan but it seems that it has not been implemented on a large scale. The government considered investing in the field of counter-narratives but decided not to embark on this path, especially after exploring experiments like the one conducted in the UK. Many of these measures were included in the law presented to the Council of Ministers on July 9, 2014 and promulgated on November 13, 2014. The law included an exit ban (IST, interdiction de sortie du territoire). It prohibits French nationals from leaving the territory if they are suspected of planning to participate in terrorist activities abroad. Considering the shift to “inspired attacks” and relatively solitary radicalizations, a crime of “individual terrorist enterprise” was established. This made it possible to prosecute a person with no known connection to a terrorist network who could not have been charged under traditional French law (terrorist criminal association). It appears that this charge has rarely been used since its creation. “Individual terrorists” are indeed less isolated than one might think. After the January 2015 attacks, the government ramped up the human and material resources devoted to the fight against terrorism at the ministries of the Interior, Justice, Defense, and Finance. It announced that 2,680 new jobs would be created and raised the budget by €425 mn. On January 28, 2015, the stop-djihadisme.gouv.fr website was launched, along with related accounts on Twitter and Facebook. The communication policy aims to encourage reporting through the hotline, highlight the penalties for promotion of terrorism or other terrorist activities, promote specific campaigns such as the one against conspiracies, and support the military and stabilization operations of France and its allies in war zones, with a particular focus on Syria and Iraq. This account rarely engages directly with jihadist narratives, except during specific campaigns, such as #ToujoursLeChoix #AlwaysTheChoice. These efforts sometimes provoke counter-campaigns which use the visual codes of the account to “troll” it. This plan also led Prime Minister Manuel Valls to entrust two members of his party with reports on the issue. Malek Boutih was tasked with analyzing “the individual and collective dynamics that lead individuals, often young people, to radicalize, to better prevent them”. His report, titled Radical Generations, was taunted in the press. Sébastien Pietrasanta was put in charge of “identifying, improving and proposing solutions” for people who were already radicalized. His report titled Deradicalization, A Tool Against Terrorism presents 37 recommendations, from psychological monitoring to dedicated areas in prisons. This plan was followed by more specific measures. On March 17, 2015, the Minister of Finance Michel Sapin released an action plan to counter the financing of terrorism. On July 24, 2015, an ‘intelligence law’ was promulgated. It frames the activities of the security services and gives them more capabilities, in particular to adapt to IT innovations. On November 16, 2015, in the wake of the attacks in Paris, the President of the Republic announced a ‘security pact” aimed at creating 5,000 police and gendarmes (rural police force) jobs within two years, 2,500 more in the justice sector, and an additional 1,000 in customs. Furthermore, the downsizing of the defense sector was frozen until 2019. A major new package called PART (Action Plan against Radicalization and Terrorism) was presented on May 9, 2016 by Prime Minister Manuel Valls. It consisted of 80 measures, comprised of 50 new ones and the extension of 30 existing measures. This initiative was about means: new jobs, new credits and new legislative tools. However, there are a number of measures that had already been announced but whose implementation is long overdue, including the doubling of the capacity to handle radicalized people and their families within two years, education of youngsters about the media and information, and the prevention of radicalization in sports. A permanent scientific council on radicalization and terrorism was also created (it seems that it has met only once). Scientists as well as representatives of the Muslim community and “internet actors” were called on to contribute to the development of counter-narratives. The organization of the Euro 2016 games a few months later led to specific measures – mobilization of armed security forces, including the reserves, and the launch of a smartphone alert application. Named SAIP, this app has been repeatedly dysfunctional. At the Ministry of Justice, a fully-fledged intelligence service belonging to the second circle of the intelligence community was founded. This 2018 plan was eagerly awaited because it is the first under Emmanuel Macron’s presidency. That said, it would be more accurate to talk about the Édouard Philippe government, since the development and implementation of such inter-ministerial programs is much more the jurisdiction of the PM than the president. The plan’s release was marked by an impressive mobilization of the government. Twenty ministries or state secretariats were involved in its preparation and a dozen were present at the launch. This demonstrates that radicalization is a multi-faceted phenomenon and an important one too, requiring the involvement of large parts of the state apparatus, including Justice, the Interior, Education and Youth, and even Health and Sports. To protect minds from radicalization. To complete a detection / prevention continuum. To understand and anticipate the evolution of radicalization. To professionalize field actors and evaluate practices. The first axis involves the Education ministry at a much higher level than in the previous plans. It is no longer only a matter of preventing conspiracies or promoting education about the media, the values of the Republic, or “laïcité” (French secularism). It is now about “fluidifying the detection” of radicalization by involving the heads of school and training the police and gendarmes involved in prevention missions in schools. In addition, four of the measures (5 to 8) aim at supervising uncontracted private schools as well as home schooling. The primacy is clearly given to detection. It claims to be protective but reveals an inclination to the doctrine that can raise questions, especially in schools. Once radicalized students are “screened”, what should the procedure be? Disciplinary? Reporting to social services? This first axis also looks at the internet and embraces the fight against online recruitment. The plan calls for better cooperation between Francophone countries (within the RAN for European countries, if not the OIF – International Organization of Francophonie) and revives the idea of encouraging counter-narratives by multiplying registers and segmenting audiences. In terms of institutional communication, the Stop-Jihadisme platform is maintained in its format and its tasks. The second axis is devoted to state and local administrations, sport and higher education. Despite its title of “detection / prevention”, the main measures include the removal of civil servants from their duties if their behavior violates their obligations of neutrality or laïcité and development of administrative control by the prefectures of sports disciplines impacted by radicalization. The plan points out that certain activities at risk, such as bodybuilding or paintball, are not organized into federations. The “companies” package (measures 27 to 30) introduces standardized training to identify risk situations and to highlight reporting procedures. Professional federations and regional branches of the Ministry of Labor (DIRECCTE) will be key players. The third axis, devoted to knowledge of the phenomenon, provides some clear improvements compared to previous programs. The authorities seem interested in developing a French sector of expertise in radicalization. At present, security studies do not exist as such in France, where criminology is a discipline that struggles to settle on a scientific basis and most researchers working on radicalization are generally sociologists, psychologists or Islamologists. The meagre success of French institutions in gaining European funding like H2020, despite strong university curricula in social and human sciences, should now lead to greater state support for the consolidation of the sector. A limited, selected and accredited group of researchers will be given access to some anonymized data from the FSPRT (Terrorism Prevention and Radicalization Reporting File), a set of 19,000 records which is by far the best database profiling radicalization in France. The police and intelligence agencies jealously guarded the files until now, and not only for bad reasons! Measures 49 to 51 aim to involve the scientific community in research for action programs. Stakeholders will be encouraged to interact with their counterparts abroad. The fourth axis is an extension of the third and must be understood as a response to frequently expressed criticism, some of it trivial, of the French policy of prevention and management of radicalization. It aims to remove unprofessional actors, “self-proclaimed gurus”, or opportunistic entrepreneurs by imposing professionalization of the workers and institutions involved as well as their evaluation. In particular, institutions involved in handling radicalized people should see their actions evaluated by a committee of funders (measure 45). If an organization has failed to fulfil the objectives set in the context of a service agreement with a public body, it will not be allowed to continue to operate without corrective action. Nor may it seek funding from other public entities. Measure 38 addresses the recent concern expressed by doctors who feared being used as informers by the police in reporting radicalized patients. It plans framework agreements between the ARS (regional health agencies) and the prefectures. It is likely that their development will spark lively debates. Social work associations, which are major players in social integration, are also taken into account. They should be given the benefit of common guidelines for good practices. The SG-CIPDR will also improve the vocational training offer by setting specifications and mapping the available training possibilities across the country. Lastly, the plan seeks to involve the decentralized echelons (departmental councils, municipalities) both to benefit from their knowledge of local issues and to share the financial burden. In particular, it expects to generalize radicalization prevention plans within the framework of city contracts. The fifth axis tackles the handling of radicalization. “Disengagement” is the word used by the authorities instead of “de-radicalization”, which is rarely used in France these days. Three measures (52 to 55) set the framework for the reintegration of children returning from areas of activity of terrorist groups (68 have already returned from Syria and Iraq and more than 500 are still there). The last measures of this plan concern individuals under judicial control. They are numerous – as of February 2018 French prisons held 512 detainees for crimes or offenses related to Islamist terrorism and a further 1,139 common law detainees reported as radicalized. Four new radicalization assessment quarters (QER) will be created at Vendin-le-Vieil and Condé-sur-Sarthe. One of them will be dedicated to the evaluation of common law detainees. These QERs will reinforce the current ones located in Osny, Fresnes and Fleury-Mérogis, where 180 prisoners have been assessed to date. The current policy is to have prisoners transit for four months through one of these quarters before they are transferred to an appropriate form of detention, depending on the outcome of the assessment. A recent wave of attacks against prison guards by radicalized inmates has weighed on the decisions and the doctrine strongly supports the concentration of radicalized prisoners. The new goal is to make 450 “sealed” cells available, isolated from the rest of the prison system and divided into different segments: Isolation Quarters (QI), Quarters for the Evaluation of Radicalization (QER), Radicalization Handling Quarters (QPR), and other specific quarters such as the Quarter for Violent Prisoners (QDV) in Lille-Annœullin. In the long term, the Minister of Justice hopes to dispose of 1,500 dedicated and isolated cells. The QERs were created in September 2016 after the first experience of concentration of radicalized detainees – the Dedicated Units (UD), later known as the Radicalization Handling Units (UPRA), which had been undermined by the attempted murder of two guards at the Osny prison. One of the priorities of the penal administration is to relieve the detention facilities in Île-de-France (the Paris region). Almost all terrorist detainees are currently concentrated in this region and it suffers from some of the highest rates of prison overcrowding. This administration has been allocated additional funding following the recent wave of attacks. A large part of this extra budget is likely to be absorbed by these measures, which will drive investment in building as well as new human resources to meet the additional needs for guards and integration and probation staff. The DAP (Directorate of Prison Administration) will secure the prison, both for the supervisors and other prisoners in order to protect them from both violence and proselytism. Individuals under judicial control outside the prison system are not left out. The “RIVE” experiment (Research and Intervention on Extremist Violence) led by the association APCARS in Île-de-France has been praised for its success. It will be extended in the region, with a target of 15 people supported increased to 50. It will also be duplicated in the provinces with the launch of similar programs in Lille, Lyon, and Marseilles. This program is quite intensive, multidisciplinary and focused on mentoring. It is the main response of the administration to the failure of the “House of Pontourny” ‘ the first French de-radicalisation centre, inaugurated in September 2017 in the Château de Pontourny and closed few months later – caused by a number of factors including the strong opposition of the neighborhood and the fact that it was open to residents only on a voluntary basis. Measure 59 responds to one of the major challenges ahead, which has not yet been fully addressed: the criminal justice legacy. In the coming years a high number of prisoners convicted of terrorism-related offenses or reported as radicalized (70 to 80 “returnees” from Iraq and Syria within two years) will be free. They will require particularly intensive reintegration work to prevent violence. One could regret that the new plan is less detailed than the previous one, in which each measure was developed in a paragraph providing figures, detailed objectives or information on the means of implementation. It would also have been preferable to see more official evaluation of the measures adopted in earlier plans. But a political communication exercise covering such a highly sensitive issue usually does reinforce a tendency to put forward ambitious goals and far too many measures, including some already decided, some implemented, and some whose realization is uncertain. These plans are the reflection of the preoccupations, even the hype of the moment. For example, as Marc Hecker of the international relations institute IFRI has pointed out, the word “intelligence” appears only once in the appendix of the last plan. By contrast, there were sixty appearances in the 2016 paper. Furthermore, some important issues are not addressed in this plan. Notably, the whole religious aspect is ignored. This is explained by the fact that Emmanuel Macron has announced a vast plan for organizing Islam in France that is due to address the religious aspects of radicalization. On the other hand, while the term used in the previous plans was “violent radicalization”, the focus on violence has blurred and it is indeed extremism as such that the authorities want to tackle. There is also a risk of stigmatization in the isolation of the struggle against Islamism from the troubles with other kinds of extremism. Such a separation produces a counter-productive polarization. Perhaps it would be appropriate to open the debate on extending the mandate of the SG-CIPDR to all kinds of radicalization? This option has been chosen by many European countries and the RAN (Radicalization Awareness Network) already addresses far left and far right extremism in addition to Islamic radicalization. In addition, this plan, like the earlier plans, does not provide a working definition of the word “radicalization”. It is important to find a national consensus on the subject. It would contribute to a better understanding of the term by the public, which should not associate radicalization with a single category of extremists. This question brings us to the central difficulty for a liberal and democratic state countering the phenomenon of radicalization. It is often no crime at all and by law its prevention cannot contravene our fundamental principles of freedom of expression, conscience, and worship. Yet radicalization is a break-away process from the social consensus. It puts people at risk of marginalization, weakening national cohesion, and potentially even committing violence. Judging the new plan before its implementation in concrete actions is not easy. Still, while this package has only just been unveiled, it is important to note the importance given to prevention. Two of the five axes are entirely dedicated “to protect minds from radicalization” and “to understand and anticipate the evolution of radicalization”. We can only rejoice. Remedial measures are of course essential to handle people who are already radicalized. But if the flow of these people is not dried up at the source, their numbers will grow and we will lack the ability to manage the risk. This is the challenge of prevention. While some aspects may appear to be absent or insufficiently addressed by this plan, this observation should be contrasted with actions undertaken in these specific topics, like intelligence. In the end, we can only welcome the move to professionalize local actors and to equip ourselves with better tools to evaluate actions. This is a decisive step towards a continuous improvement of practices based on feedback. Will this plan achieve its objectives? We can only wish it. And contribute. Because its concrete evaluation, the only one that is worth anything, will be revealed by its results.